Grinch. Star Wars. Mashup. What could be better to celebrate the release of Star Wars The Force Awakens!! And….. I HAVE A TICKET FOR TODAY! W00t!!! Okay a little more to say – I painted this with Ph Martins Hydrus watercolors – then switched to Brusho for the sky! 🙂 It was 2-1/2 hours worth of filming, and didn’t include some breaks to let things dry; once the Hydrus dry, they’re permanent, which is especially great for layering colors, which I love to do. The brusho was a special touch to add that Watch the video below or click HERE to see it in HD on YouTube – and go get your tickets! One last thing to make your Friday…..a vlog came out this week! oh my, two weeks in a row, whatsoever shall we do? Below are links to the supplies I’ve used for today’s project; click on the listed items to go directly to it. Affiliate links may used, which means if you make a purchase I receive a small commission at no extra cost to you. I truly appreciate your support toward the costs of running this blog! Read more. Way awesome! Love Snoopy and Lucy…..had a beagle Snoopy and now we have a Lucy. Love the mashups you did here! My kids will love seeing this! Thanks so much for sharing it! What adorable and amazing images. So fun to see what you are going to create. It always makes me smile. Thanks for the happy and fun post. Merry Christmas and the Happiest of New Years to you and yours. SO true Sandy..but I have that feeling with ALL stamp releases..they are coming out to often and with way to much…. I have a box from Ikea here in my room..with XMas stamps and related goodies..also always stamp all the stamps I buy on a binder from each stamp company I have one…and also have a special Xmas one…so I know what i have.. I also say for three years now I don’t need to get more Xmas stamps….but just like you…when I see the one I NEED to have…it comes to live with me..
but I try to keep it to a maximum of three stamp sets….no more…. It is so much fun to make Xmas cards…I love to make them..love the cuteness…but always have so much stress around this time of the year..always feels like it comes to soon and there is way to much to do..
have a great Xmas ..and my very best wishes for 2016! Oh yeah, I sooo agree with you! I keep all my Christmas stuff together in what used to be one box, now has morphed into two and growing. Yet do I stop??? I SWEAR that I’m not going to by anymore Christmas stamps or dies or embellishments….then they come out with the most AWESOME stuff, and I cave! The next thing I know Christmas goodies are just falling right into my shopping cart. Then go you to checkout and you can’t just remove them, they’d be so lonely and feel unwanted…sooo they show up in my mail box. Even though I make 90% of my Christmas cards unique I still have extra stuff. Does that stop me, NO. Will it next year, probably not since some is due to hit my mail box any day now!!! They need to stop designing such awesome stuff!!!!!! Have different stamps and decided to make several of each and send them for caring hearts card drive. I’ve refrained from buying Christmas stamps for a couple of years now, but as I am making my cards this year, I find that I am getting tired of the stamps I have. I have already passed some on to a friend’s daughter, and I think I will try to buy some new ones next year. These paintings are absolutely amazing! You never cease to amaze!!!!!! Sandy, you never cease to amaze me, you are simply fantabulous! I watched part of your periscope and I cringed at how dark the greys were on snoopy! But of course I should have had more faith because he looks fabulous! And the darker greys suit the feel of the theme too. I can’t wait to see the movie. People are lining up here to get tickets and they aren’t available online. Grrr… Guess I will have to wait for the crowds to die down a bit. I was inspired by you to try my hand at periscope and it went pretty well. I’ve bought a boom Mike stand for my phone so I can do more. Thanks for the inspiration. Are you willing to part with the Grinch. I have a very good friend who would love this. Of course I lone it too. Can you put a Sold sign on Lucy and Snoopy, please? I love it. Grinch never looked so good, thanks to you – absolutely fantastic!!! Sandy I LOVE the grinch painting so much!!! Great job! How did you get the brusho so precise on that painting? I’d probably get it everywhere!! Unlike you, I remember where my stamps are, but I’M TIRED OF THEM! And since my budget is quite limited, I choose to spend it on “year round” things. Maybe I’ll skip next year and my friends won’t remember by the next time! Hope you have a wonderful time remembering the birth of the Savior! BTW I love what you did with the journaling Bible. That must have taken some time! But worth it. Well, the force is strong in you…lovew what you did with both of these. I still have tears of hilarity rolling down my face. Sandy, you are such a talent!! Love your Star Wars themed artwork! Enjoy the movie today! All I can say is WOW!! You are such an amazing artist, I love watching you, speed-ed up or not!! Thank you so much for sharing your talent with us. The Grinch is just awesome – the Brusho is a brilliant touch. 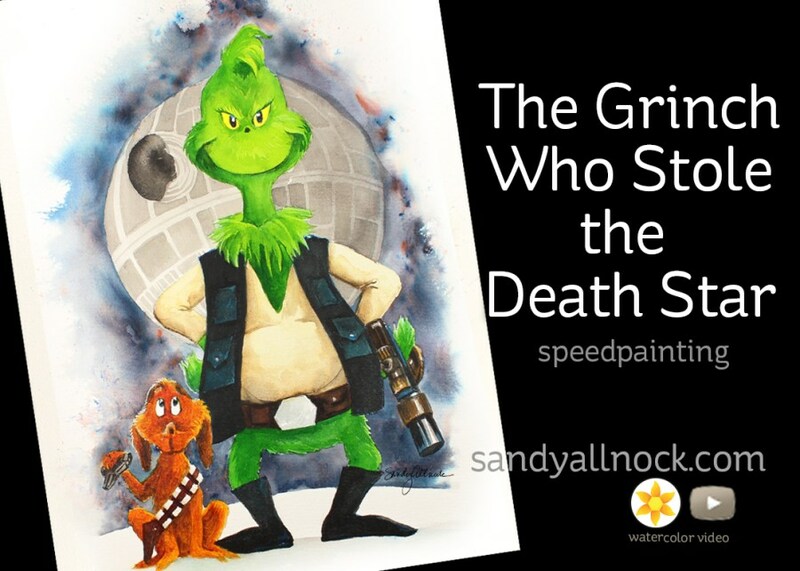 Love the Star wars Grinch–can’t wait to see the movie! Thanks for the stamp rant–so true! But I have my last year’s stamps in my clear box with all my other stamps–so I don’t hide them with the Christmas decorations. So cool that you are sending out RAK stamps–lucky winners! I try to do a little purging in my craft room at least once a year, and give tons of stuff to my OT friend, who works in schools to use with all the kids there. Whatever she can’t use, she passes on to other teachers. So thanks for all you do and have a very Merry Christmas! For the love of Christmas pudding – this was truly amazing to watch. Over and over. I plan to watch the steps and learn, learn, learn. The addition of pigment powders was genius! The painting so hairy! Your video so musical! Your efforts so merry! Thank you again, and again. A.May.Zing! Love the mash-up, it’s so awesome! And those Christmas stamps? Well, I keep them bundled in the same place as my usual stamps so that I have them when I start mailing things out which is always a huge fluctuation! Blessing others with those stamps is a great “kindness”, thank you! Wow! It was absolutely amazing to watch you paint at that speed! I love, love, love your Grinch painting! You combined my favorite Christmas movie with one of my very favorite movie series. I just love Max as Chewbacca. Super cute! Wow! Star Wars Grinch is awesome! I love seeing these characters come to life at warp speed 🙂 And you have an Amen from me too about Christmas stamps. Some are beautiful and I really want them but am trying to restrict myself to those I can use during the year too, because as you said, there will be new ones that I want next year and the old ones will get no love. Merry Christmas. How right you are! I had to make a promise to myself, (promises Which I brake often) that I would not, would not, buy any more Christmas stuff this year. I found so many stamps in my box that I did not even open from last year. I think sharing is a great idea. Remember when you did not want to eat your dinner and your Mom told you that the children in Africa were starving. Same situation. Some people out there are starving for some stamps, any kind of stamps really. There a lot of people who would love to get into cardmaking but do not have the means to do it. I don’t know how to find these ladies or gents. But if I did, I could probably gather a few stamps and things from my friends and share. What do you think? Hi Sandy, by the way Great name. Wow, are you so talented!! Gonna show my boys these, they went last night to Star Wars. May you be truly Blessed!! Looking forward to new things in 2016. God Bless, Sandy S.
Hi Sandy, your speed painting gave me a headache (too fast for me) but your rant put a big smile on my face. I’ve been a good girl for most of the summer, but I went on an online shopping spree during the Black Friday sales. Hopefully, all goodies will arrive here in Greece before Christmas (keeping my fingers crossed) and of course there’s quite a few Christmas stamps among them. Fortunately, I love making Christmas cards all year round, but I do confess I have quite a few as yet unused stamp sets in my stash. I am making a conscious effort to break into my NBUS (never-before-used-schtuff) on a regular basis, though, being nudged on by good ol’ Darnell Knauss. Wishing you a wonderful Christmas! Sandy is the grinch for sale? Love him!! You guessed it Sandy we all like to buy new Christmas every year even if we don’t need them. I keep my Christmas stamps in 2 large containers under my bed and dresser. So if i want to make Christmas cards In July I have to go and get them. I never keep any of the holiday stamps in my craft room I just don’t have the room for them. Merry Christmas and A Blessed New Year! 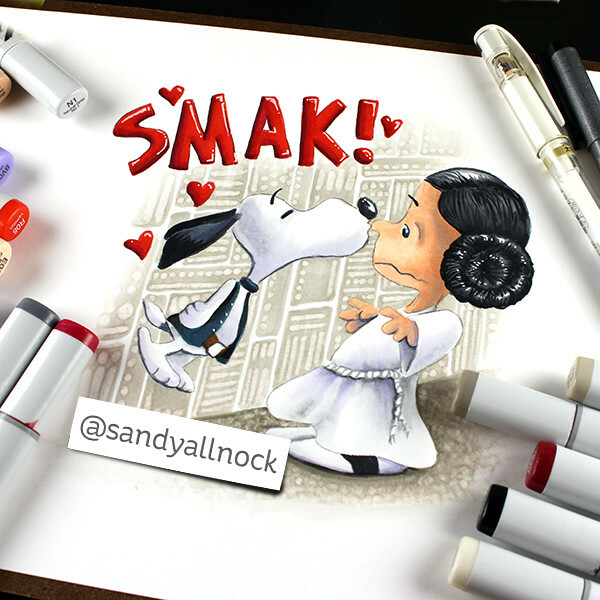 The Peanuts Star Wars mashup is so darn cute! Here’s one AMEN for you. How dumb is this…I just sent off an order 2 days ago that included yet another set of Christmas stamps? I probably won’t get it till 1-2 days before Christmas, and by next year I’ll probably have found 5-10 new sets that I’ll just have to have, so will it ever even get used? Anyway, can’t tell you how much I love the Snoopy/Lucy drawing. Hope you have a Blessed & Merry Christmas! Black brusho was an amazing addition. I just love this! Snoopy and Lucy are GREAT! Thanks Sandy!